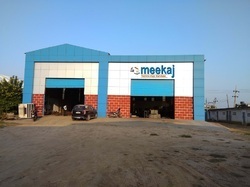 Started in the year 2012, we, Meekaj Techno App Services, are valued and known among our customers for manufacturing and supplying a wide range of the finest quality of Vacuum Systems & Water Jet Parts. Our effective product range comprises Vacuum Systems, Jet Ejector System and Steam Jet Ejector System. Their less power consumption, high efficiency, optimum functionality, user-friendly operations and longer functional life, make these systems extremely popular among our customers. In accordance with the specifications provided by the customers, these steam jet ejector systems and vacuum pumps can be customized. Rendered by us at industry leading prices, the offered steam jet ejector systems and vacuum pumps are widely used in chemical, food processing and pharmaceutical industries. Our ability to meet the bulk demands as helped us in winning the trust of our customers in the most efficient manner. Boasting on a very congenial environment, we work to attain maximum customer satisfaction. We follow customer centric approach and ethical business policy to attain the utmost customer satisfaction. Mr. Dharmendra Gadhavi, our proprietor, has helped us to attain utmost satisfaction of our customers. We believe that his experience and knowledge of this domain are driving force behind our remarkable position in this domain. Owing to his business ideas and excellent management skills, we have been able to attain a remarkable position in this domain. We deal with our costumer as a partner considering long term business relationships with great sincerity. Our products meet the very highest demands in regards with quality, reliability and ease of use. Also our products and services are provided within the promised delivery times and adhere to agreed prices and terms. We work and act such that we attain high quality within internal service, administration, behaviour and customer relations, and that each job we do gives us a good reference for future business. Our state-of-the-art infrastructural base is the backbone of our organization and helps us in staying ahead from other competitors in the industry. This infrastructural base includes departments such as procurement, production, quality testing, R&D, warehousing & logistics, sales & marketing, etc. The production department is resourced with modern production technology that enables us to develop reliable products and cater diverse requirements of clients. Additionally, in our quality testing department the product range is tested on various quality parameters. Analysis of the performance of existing system and inform the actual utility consumption i.e. steam consumption , power consumption etc and we can modify the same to reduce the operating cost or can supply new system with less utility consumption. Also our products and services are provided within the promised delivery times and adhere to agreed prices and terms Manufacture and supply high-quality and standardized products, based on market needs, as well as offering good service and expertise within this line of business. Meekaj serves a broad range of companies and organizations across multiple markets and geographies. Our fundamental business strategy is building long-term client relationships. With more than 20 years in the industries, we have attracted and retained clients by providing superior customer value—in fact, over 80 percent of our work is repeat business from loyal clients. This strategy yields cost advantages, profits, and growth, which allows us to attract and retain investors, and thus fuel further growth. The combination of a loyal client base and steady growth enables us to attract and retain the industry’s top talent. As a result of this sound business strategy we are prospering in diverse markets throughout India. We are supported by proficient team of professionals, who hold rich industrial experience in their respective domain. In our team, we have professionals from various sectors of the industry. All our professionals work cohesively with each other to achieve pre-defined goals of organization in an effectual manner. Our professionals make sure that every requirement of clients is fulfilled. In order to boost skills and market understanding of our professionals, we organize important workshops, seminars and training session programs.